More than 1,400 illegal immigrants from Africa arrived in Spain's Canary islands on Saturday and Sunday. Spanish police said 674 migrants arrived in makeshift boats on Saturday, and more than 700 were reported to have landed on Sunday. Spain has been struggling to cope with the recent influx and is trying to organise an EU response to the crisis. Some 20,000 illegal immigrants have arrived in the Canaries this year - four times the total for 2005. Estimates of the number that have died en route range from 590 to 3,000. Several boats carrying a total of 674 people reached the Canary Islands in the space of 24 hours on Saturday, Civil Guard officials said - close to the record for a single day. More than 700 had landed on or been intercepted off the islands of Gran Canaria, Tenerife, El Hierro and La Gomera on Sunday. Officials said reception centres already contained more people than they their official capacity of 5,446, and that an additional 700 people were being held at police stations. Tens of thousands of migrants, mostly from sub-Saharan Africa, have attempted to reach Europe this year, often undertaking dangerous sea journeys in rickety boats. The Canary Islands, located off the west coast of Africa, have become one of the main points of entry for illegal immigrants seeking to reach the European Union. 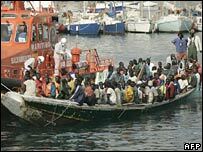 The Spanish government has been negotiating with African nations in an attempt to stem the number of migrants and has called on other EU countries for help in patrolling international waters. The EU began an operation in August to turn back small boats carrying migrants from Cape Verde, Mauritania and Senegal to the Canary Islands. But Spain says more boats, planes and personnel are needed.